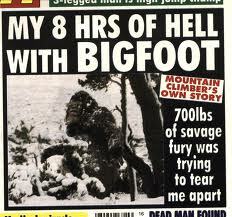 If you are intrigued by Bigfoot, or a fan of beer, or really just need some cash, you are in luck. The Olympia Brewing Company, based in Olympia, Washington is offering a reward of $1,000,000 for the capture and SAFE return of Bigfoot. Click here to enter read more and enter the contest! This entry was tagged bigfoot reward contest, New Falcon Project, Olympia bigfoot capture, Olympia Bigfoot contest. Bookmark the permalink.